Our organization is counted amongst the most distinguished traders, wholesalers, suppliers and importers of superior qualityMetal Ceramic Nozzles. We supply low cost ceramic nozzles for shot blasting. These nozzles can be used directly for pressure blasting machines i.e. both portable blasting machines and cabinet type pressure blasting machine. These nozzles work really well with minerallic media like glass beads, garnets, aluminium oxide etc. We offer Ceramic Product to our clients on the basis of their requirements. We provide world class ceramic nozzle, welding nozzle, pressure ceramic nozzle, which are ISO certified. Our pressure ceramic nozzles are best in the market and offered at market leading prices. They are destined to provide long life and require lesser maintenance. Ceramic Sleeve Made From High Grade Auminia Material With mirror Finish , Nozzle manufactured as per requirment in various material like Mild Steel, Stainless Steel, D2 , EN8, Aluminium and matched with high Accuracy. With our expertise and trustworthiness, we are engaged in offering an optimum quality range of Ceramic Nozzle. We introduce ourselves as the leading trader of precision-designed Torch Consumable Ceramic Nozzle. 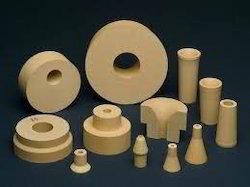 We are a well-known name in engaged in offering quality Ceramic Nozzles. 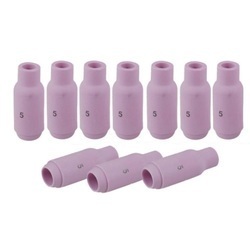 To meet the diverse needs, we offer these nozzles in different sizes and shapes to the patrons. These nozzles are trouble-free to install and tested on various grounds before the final delivery so as to offer the clients faultless products.